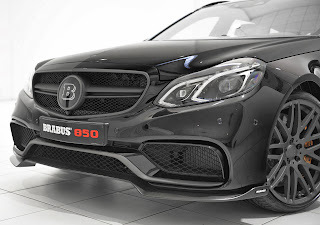 The BRABUS E63 AMG Bi-Turbo Produces 850 Hp! German Mercedes specialist BRABUS revealed its tuning package for the 2014 Mercedes-Benz E63 AMG wagon at the Essen show. The package is compatible with the rear wheel drive and 4MATIC versions and will help the car produce as much as 850 Hp. The 5.5-liter Turbocharged V8 originally producing 580 Hp and 800 Nm has seen its displacement increase to 6.0-liter and two bigger turbos with a higher compression rate were installed. 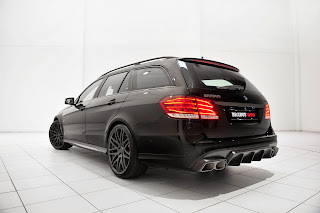 The result is a wagon that develops 850 Hp and 1,150 Nm of torque. The car is now able to hit 100 km/h in 3.1 seconds with a top speed of 300 km/h (186 mph). The top speed can even be raised to 350 km/h (217 mph) if you opt for the high performance tires. More details in the press release and more pictures after the jump. 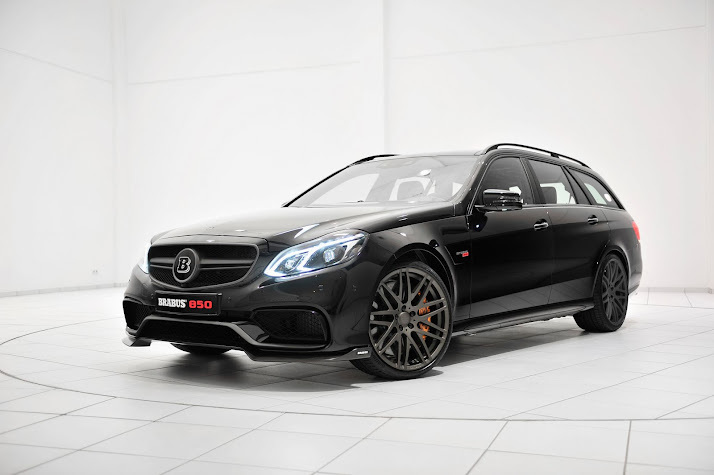 Powered by the most powerful BRABUS engine to date, the new 850 6.0 Biturbo V8 high-capacity engine, the five-door supercar delivers superlative dynamics: As a 4MATIC all-wheel-drive model the wagon from BRABUS (Brabus-Allee, D-46240 Bottrop, phone + 49 / (0) 2041 / 777-0, fax + 49 / (0) 2041 / 777 111, internet www.brabus.com) sprints to 100 km/h (62 mph) in just 3.1 seconds. Top speed is limited electronically to 300 km/h (186 mph) to protect the tires. The BRABUS 850 6.0 Biturbo, which is of course also available as a sedan, impresses not only with superior performance, but also with its sporty-elegant BRABUS aerodynamic-enhancement kit, tailor-made BRABUS Monoblock wheels with diameters of 19 or 20 inches, and its BRABUS fine leather interior tailored to the individual customer’s preferences. 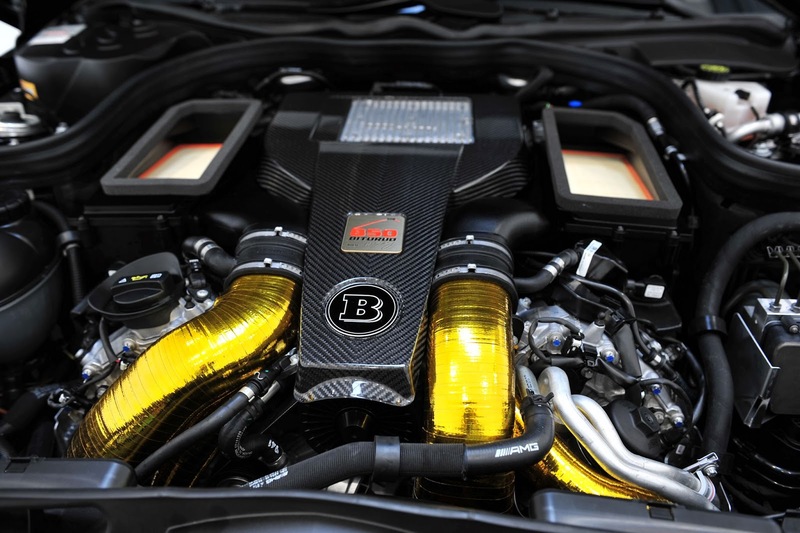 To lower the charge-air temperature and thus positively influence power delivery, BRABUS fits the intake and charge-air tubes with special "Gold Heat Reflection" sheathing. The BRABUS 850 6.0 Biturbo high-performance engine can be installed in a rear-wheel-drive or 4MATIC all-wheel-drive E 63. Due to the better traction the four-wheel-drive version in particular delivers acceleration figures only attained by a very few super sports cars or super sports bikes: From rest the wagon reaches a speed of 100 km/h (62 mph) in just 3.1 seconds. Due to the tires the top speed of the wagon has to be limited to 300 km/h (186 mph). The lower rear-axle load of the sedan allows a top speed of up to 350 km/h (217 mph) with high-performance tires, depending on the final-drive ratio and the programming of the BRABUS Vmax unit. BRABUS also offers three other power levels without a displacement increase for the current E 63 AMG models. 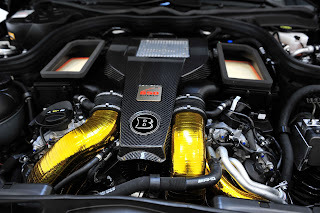 They range from 456 kW / 620 hp (611 bhp) and 478 kW / 650 hp (640 bhp) to 537 kW / 730 hp (720 bhp) in the BRABUS B63S-730 version. 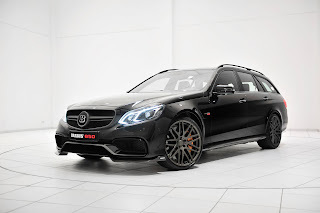 BRABUS offers tailor-made tire/wheel combinations for the E 63 AMG that match the designer outfit. The largest version features one-piece BRABUS Monoblock F or R wheels in size 9.5Jx20 with tires in size 255/30 ZR 20 on the front axle and size 295/25 ZR 20 tires in the rear. There is also a version that features BRABUS Monobock R "Platinum Edition" forged wheels in sizes 9Jx20 in front and 10.5Jx20 at the rear. The matching high-performance tires are supplied by BRABUS technology partners Continental, Pirelli and YOKOHAMA. BRABUS 850 6.0 Biturbo based on the E 63 AMG saloon: city 14.4 l/100 km. highway 7.9 l/100 km. combined: 10.3 l/100 km. CO2 emissions, combined: 242 g/km. Efficiency class F.